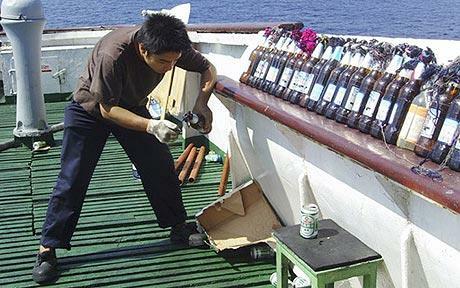 The crew of a Chinese ship used water cannon, Molotov cocktails and beer bottles to fight off an attack by Somali pirates. The captain of the Zhenhua 4 told how his well-prepared crew held off the pirates – who were armed with rocket-propelled grenades – when the ship was boarded by pirates on Tuesday in the Gulf of Aden. The ordeal of the multinational crew of 30 men ended with the arrival of military helicopters and a warship despatched by the task force fighting the piracy menace in the region. “Seven of the nine pirates landed on our ship, all with weapons,” said the captain, Peng Weiyuan, speaking to China Central Television. “Our crew, who had been well trained and prepared, used water cannon, self-made incendiary bombs [Molotov cocktails or petrol bombs], beer bottles and anything else that could be used to battle with them. Thirty minutes later, the pirates gestured to us for a ceasefire. The ship was one of four vessels seized by pirates on Tuesday, the same day the United Nations Security Council took a strong stand against the attacks and authorised countries to pursue the gunmen on to Somali soil. Rampant piracy off the coast of Somalia this year has earned gunmen millions of dollars in ransoms, forced up the cost of shipping insurance costs and caused international alarm. The Global Times newspaper, a tabloid run by the Communist Party’s People’s Daily, said on Thursday that two destroyers and a large-sized depot ship would set sail for the region after Christmas to defend Chinese shipping. The first tour of duty would be for three months, it said. According to Andrew Mwangura of the East African Seafarers Assistance programme, there have been 124 incidents of piracy off Somali this year and some 60 successful hijacks. Nearly 400 people and 19 ships are being held along the coast, including a Saudi supertanker with two million barrels of oil and a Ukrainian cargo ship carrying 33 tanks. You are currently browsing the archives for the molotov cocktails category.